Archive for the ‘30 Days of Prayer – Resource’ Category. Our family has enjoyed this prayer resource each year. It’s geared toward elementary kids but we were able to even modify this down and use it even when the kids were in preschool/kindergarten. We work through this 30 day guide in our evening family prayer times and keep a globe or map on hand to look for the focus country in relation to where we live. 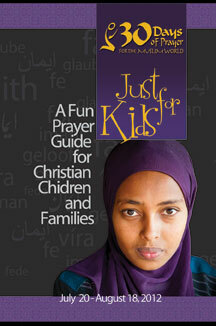 The pamphlet is excellent at helping kids understand about other cultures and beliefs alongside the prayer points. Order now so you’ll have it to start on the official date, July 20th. Product description and ordering information. Click on picture to go to www.worldchristian.com link. 2012 marks the 21st time that Christians around the world will join together to pray for the Muslim world during the 30 days of Ramadan; Ramadan in 2012 will start July 20. This is the “30 Days” booklet edition for children for 2012. This booklet follows the same daily prayer topics as the edition for adult readers, but it also includes illustrations and some fun activities. The reduced, simpler text is geared toward elementary school-age children. So, consider involving the younger members of your family or church. This annual worldwide 30 Days of Prayer for the Muslim World is for Christians to humbly learn about Islam and pray for Muslims during Ramadan (Islam’s important annual month of fasting and religious observance). Each year a new illustrated prayer guide booklet is published in dozens of languages and locations around the world. While it is primarily produced for use during Ramadan, many individuals and churches use it also at other times throughout the year.